Citizens Telephone Coop presents a Community Fiber "Gig" Party on Thursday, April 18, 2019. 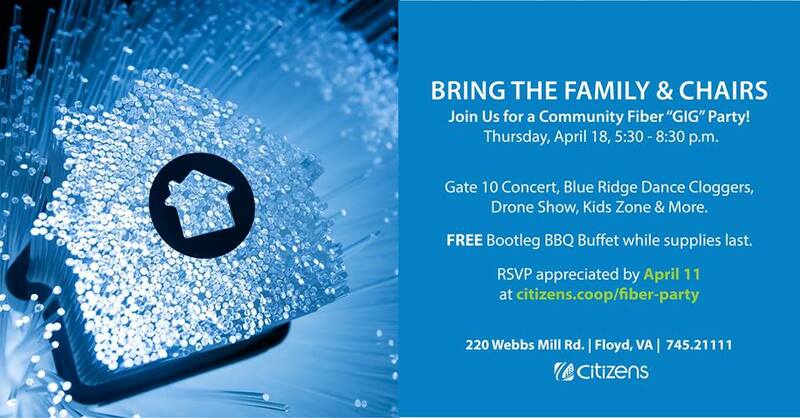 Citizens is holding a Party for the Community to celebrate the launch of our Fiber optic (Gigabit) service to the home and we want you to join us! Enjoy live music & entertainment, free Bootleg BBQ buffet while supplies last, kids zone, drone show and more! It's a family friendly event so bring your chairs and stay a while. To RSVP to the party, visit: https://citizens.coop/fiber-party/. To view the event flyer, visit: https://i.imgur.com/qx2xhwd.jpg. For more information, visit: http://citizens.coop or https://www.facebook.com/citizenstelephone or call 540-745-2111.